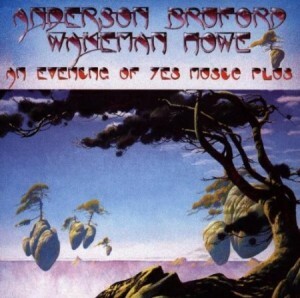 An Evening of Yes Music Plus is a live album by Anderson Bruford Wakeman Howe. At this stage another group with Chris Squires, Trevor Rabin, Tony Kaye and Alan White were performing under the Yes brand name. It was recorded at the Shoreline Amphitheatre in Mountain View, California on the 9th September 1989. It was released in 1993 and re-released in 2006. It has quite a good reputation but for a live album of the magical prog rock created by Yes in the early 1970s, I think it’s virtually impossible to look past Yessongs. Do you think this is this the best live album by Yes (or closely linked groups)? What Are The THREE Best Live Albums By Yes and Anderson Bruford Wakeman Howe? 1989 Anderson Bruford Wakeman Howe Live At The N.E.C. It is NOT nominated in the poll to find the best live prog rock albums. Do You think it should be? Because there are so many great progressive rock live albums I have split the poll into two and you may find some of your favourites in the second division. Albums will be promoted when they get enough votes. This entry was posted in 1980s Live Albums, Progressive Rock Live Albums and tagged 1980s prog, 1989 live albums, Yes Live Albums by Paul Simister. Bookmark the permalink.